Today I am showing you how to make a keto smoothie, that’s super easy to blend, perfect for a quick breakfast or as a healthy low carb snack. It contains superfoods that will help you feel energized all day long. Drinking a green smoothie almost every day is a healthy habit that keeps me on track. Eating nutritious foods can change our body and our overall health. 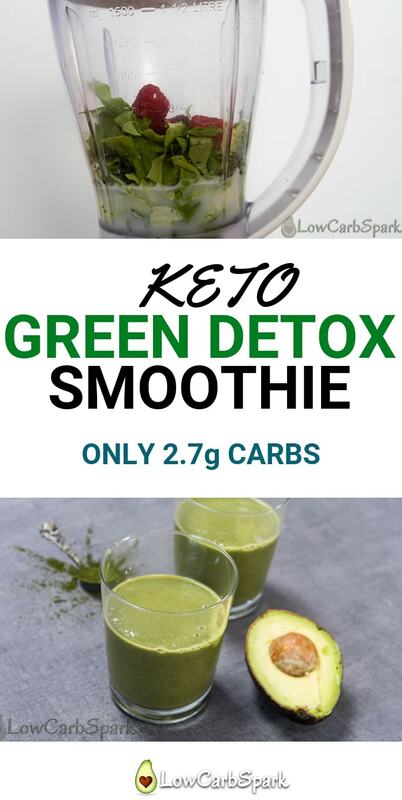 If you’re like me and find it hard to eat leafy greens, this keto detox smoothie is a great way to include them in your diet. 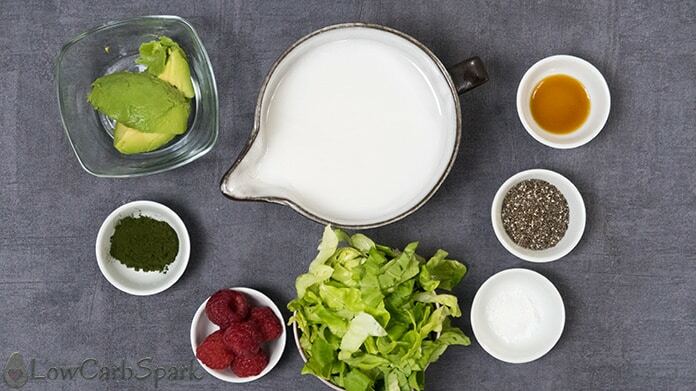 The keto smoothie recipe starts with a base of 1 cup unsweetened coconut milk. The medium-chain fatty acid ( lauric acid ) found in coconut milk will be absorbed by the body for instant energy, lowers cholesterol levels and improves blood pressure. Some studies show that coconut milk prevents heart attacks or a stroke. Chia seeds are well known for their high content of essential fatty acids, vitamins and minerals and antioxidants. Adding one tablespoon of chia seeds to your keto smoothie gives you almost 6g of fiber. The great thing about fiber is that it doesn’t raise blood sugar so that we won’t count it as a carb. Chia seeds also contain high-quality protein. Experts believe that chia seeds can help you lose weight because the protein in chia seeds reduce your appetite. 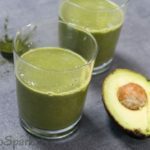 This keto smoothie is dairy-free, paleo and also suitable for a vegan keto diet. In fact, it is an excellent choice for any healthy diet. How to make the keto smoothie? Let me tell you that all you have to do is to add the ingredients in your blender and press the start button. In less than 5 minutes you’ll have a healthy green detox smoothie to drink. How many carbs are in the keto smoothie? This recipe makes two healthy keto smoothies. A serving has only 2.7g net carbs. Subtract the dietary fiber from the total carb count to get to find out the net carbs. 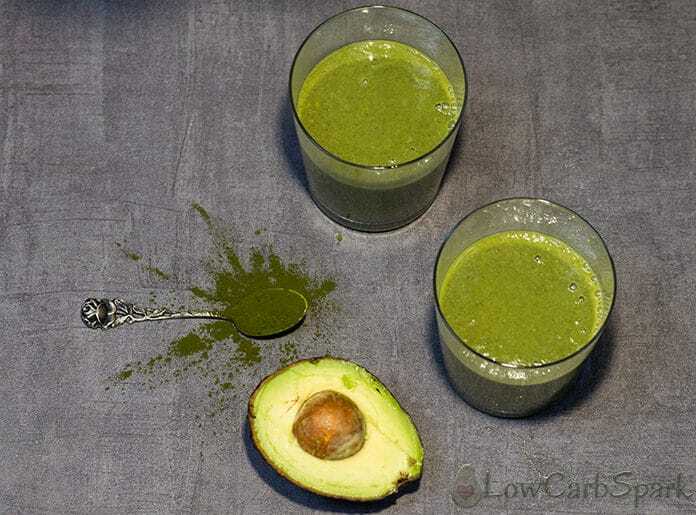 Enjoy a keto smoothie that has many health benefits and is perfect for a quick breakfast. Made only with superfoods to help you feel better. In a blender add all the ingredients. 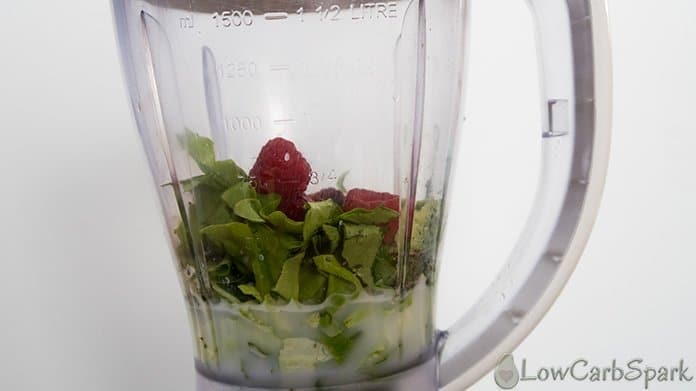 Blend on high for 30 seconds, until smooth. If you want a thinner keto smoothie, add a splash of coconut milk. Tip: Add a few ice cubes to the smoothie and blend until smooth.